Programmes Director of the Accra International Book Festival, Charles Y. Gray said the books selected by the public are 'thought-provoking' and continue to impact the lives of readers. 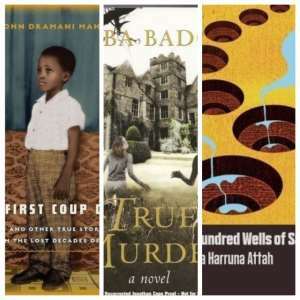 Former President John Dramani Mahama’s first book, ‘ My First Coup d’Etat ’ and UK-based Ghanaian author, Yaba Badoe’s ‘True Murder’ have been named among the 27 best and most essential books by Ghanaians. Mr Mahama and Badoe appeared alongside the likes of veteran lawyer Sam Okudzeto, Camynta Baezie, Lawrence Darmani and late professor Atukwei Okai on the list, unveiled by the Accra International Book Festival last Saturday. Also, Ayesha Harruna Atta’s latest novel, ‘ The Hundred Wells of Salaga ’ and late poet, Kofi Awoonor’s ‘ The Promise of Hope: New and Selected Poems ’ made it to the list crowdsourced from the public between January and February. The results of the #aibf27books campaign were announced at the 2018 AIBF Literary Awards held at the N8tive Food and Beverage Bar on the Kofi Annan Street at the Airport Residential Area in Accra. Hundreds of readers both resident in Ghana and outside nominated their favourite titles online, Creative and Festival Director at the AIBF, Kwabena Brakopowers disclosed. He revealed a three-member committee was tasked to work on the list focusing on the most nominated books, rave reviews by the public, and content of the books. The selected books range from End of the Tunnel by Peggy Oppong to Faceless by Amma Darko, from Ghana Must Go by Tayie Selassie and Homegoing by Yaa Gyasi, from Seasons of beento blackbird by Akosua Busia to Blood Invasion by Lawrence Darmani. Also among the 27-strong list are authors Boakyewaa Glover, Sam Okudzeto, Kojo Laing, Kofi Akpabli, Nii Ayikwei Parkes, Farida Bedwei, Letitia Obeng, Elizabeth Irene Baitie, Celestine Nudanu, Lesley Lokko, Esi Edugyan, Nana Ekua Brew-Hammond and Mamle Wolo. Programmes Director of the Accra International Book Festival, Charles Y. Gray said the books selected by the public are “thought-provoking” and continue to impact the lives of readers. He noted the list was influenced more by the public through their nominations and reviews, than the work of the three-member committee.